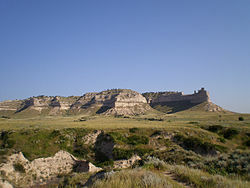 Scottsbluff was founded in 1899 across the North Platte River from its namesake, a bluff that is now a U.S. National Park called Scotts Bluff National Monument. The monument was named after Hiram Scott (1805–1828), a fur trader with the Rocky Mountain Fur Company who was found dead in the vicinity on the return trip from a fur expedition. The smaller town of Gering had been founded south of the river in 1887. The two cities have since grown together to form the 7th largest urban area ( Scottsbluff Micropolitan Statistical Area) in Nebraska. As of the census  of 2010, there were 15,039 people, 6,168 households, and 3,672 families residing in the city. The population density was 2,417.8 inhabitants per square mile (933.5/km2). There were 6,712 housing units at an average density of 1,079.1 per square mile (416.6/km2). The racial makeup of the city was 83.0% White, 0.8% African American, 3.4% Native American, 0.8% Asian, 9.8% from other races, and 2.2% from two or more races. Hispanic or Latino of any race were 29.1% of the population.